If you’re a little skeptical about serving pizza on Thanksgiving, I am here to quash all your fears. 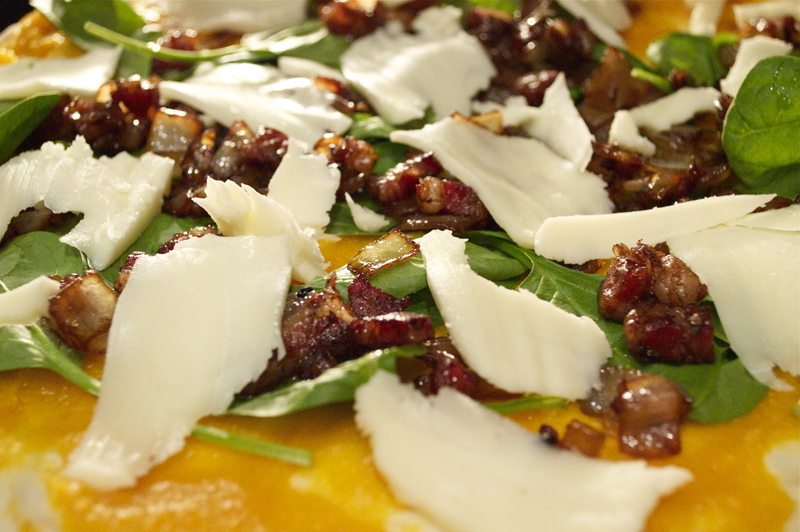 This pizza, which forgoes sauce for mashed butternut squash, tastes like an explosion of fall and Italy – two of my favorite things. Thanksgiving may be an all-American holiday, but what day isn’t better with pizza? I first tried this pie at my favorite Italian pizzeria, and it was love at first bite. When I tasted this pizza for the first time a few months ago, I was instantly transported to cozy November days even amidst the humid summer night. This pizza simply tastes like fall, so I knew I had to make my own version of it for a Thanksgiving appetizer. 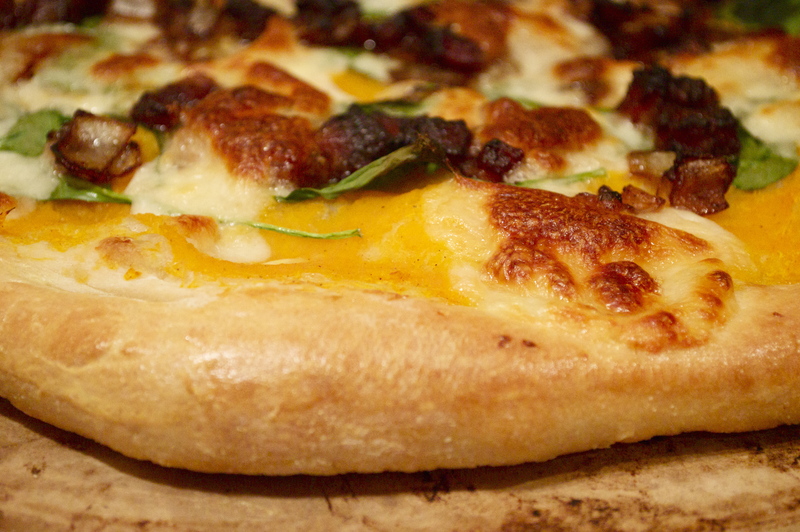 The easiest way to make amazing pizza is to start by purchasing dough from your favorite local pizzeria. Most places will sell you their dough for a few dollars, and you can’t beat its texture, taste, and time-saving capabilities. Once you have your dough, place a pizza stone in the oven and preheat it to 425°F. Next, peel and cut your butternut squash into 2 inch cubes. Bring about 6 cups of water to a boil and stir in the chicken bouillon cube. Once it’s dissolved, add the squash and cook until fork-tender, about 15 minutes. Add a sprinkle of nutmeg and cinnamon to taste. Then take a potato masher, and mash the squash until smooth. 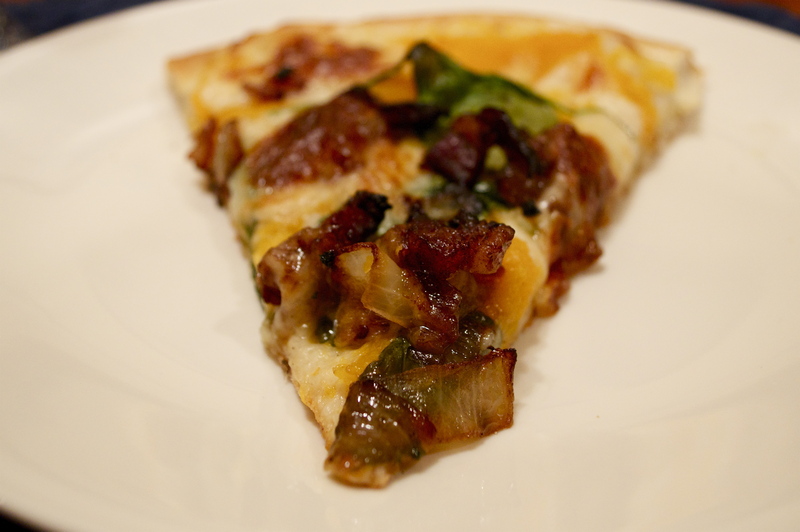 In a frying pan with a dash of oil, sauté onions and pancetta until brown and caramelized. Once everything started to brown, I deglazed the pan with a little red wine to get all the flavor that was on the bottom, but this is an optional step. Next, stretch the dough on a lightly floured surface, then place it on the pizza stone (the stone will be hot, so be careful!). Next, spread the mashed squash onto the dough like you would with tomato sauce. Then toss on the spinach, onions, and pancetta, and finish with the mozzarella cheese. Finally, beat one egg and a dash of water in a bowl to make an egg wash, and brush it onto the pizza crust. Let the pie bake for about 15-20 minutes, or until the crust is a light golden brown. Try it for yourself, and enjoy an Italian twist this Thanksgiving!